As leading operators roll out third generation (3G) mobile services to grab a chunk of the profit pie, Idea Cellular discusses investment and heralds a long awaited rise in Average Revenue Per User (ARPU). The operator has announced that of its subscriber base of 86 million mobile subscribers as of February 2011, 5.5 million use 3G enabled handsets and are its target audience. That's just 6.3% of its user base. 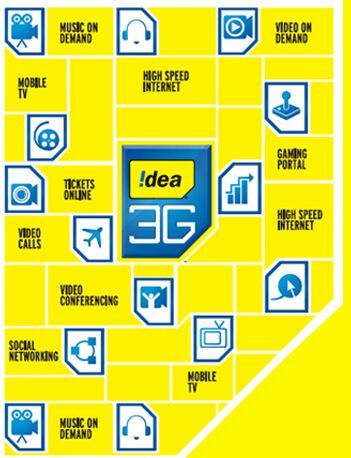 Idea expects its ARPU to grow with the adoption of 3G. Idea Cellular's deputy managing director Himanshu Kapania has said that the company's total investment in rolling out 3G has amounted to Rs 10,000 crore, inclusive of the auction fee of Rs 5,800 crore, Cybermediareports. Idea had 13.3% revenue share in the third quarter of this fiscal and has acquired licenses in 11 telecom circles. It has launched 3G services in three circles so far - Madhya Pradesh-Chhattisgarh, Gujarat and Himachal Pradesh. As of March 2011, RCOM had launched 3G in 18 cities, Aircel in 10 cities, Tata Docomo in 9 circles, Airtel in 12 cities and Vodafone in 2 cities. Government owned operator BSNL had a head start with 3G compared to these private operators and is present pan-India. For more on the coverage, read Techcircle.in. In a move to attract customers, Idea has introduced a slew of plans that are time-based and usage-based. The company recently partnered with Axis Bank to provide basic banking services on mobile space and launched 'Idea My Cash' to ensure money transfer via mobile devices.